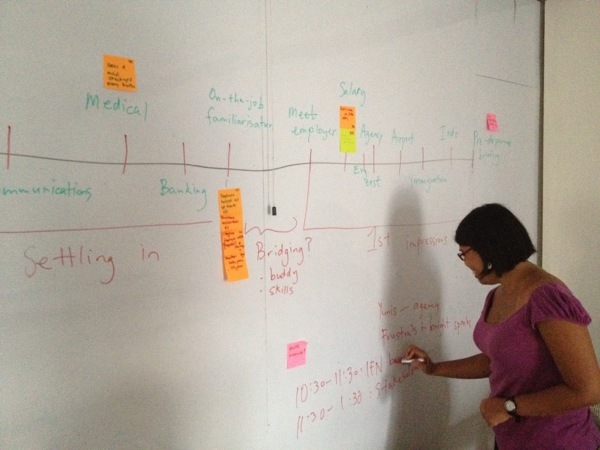 On the consulting front, we're currently working on a project for migrant workers in Singapore. Our client is a nonprofit that works to advance the welfare of migrant workers here. Our challenge: to uncover a business opportunity for a product (or service) that improves the quality of life for migrant workers. We haven't synthesised everything yet, as it's still early in the project, but here's a fun snippet we captured: creating the user journey map. Really good for putting us in the shoes of our user/beneficiary. We know this is a brief one - we'll be sharing more shortly!